All told, 24 million U.S. children younger than 18 are living with an unmarried parent. Most (15 million) are living with a solo mother. In comparison, 5 million live with cohabiting parents and 3 million live with a solo father. In 1968 – the first year for which these data are publicly available – 9 million children were living with an unmarried parent, 8 million of whom had a solo mom. 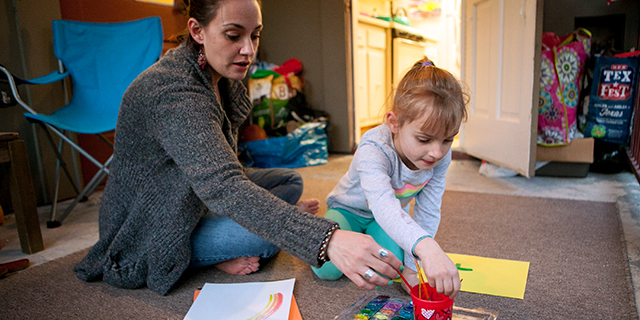 The rise in U.S. children living with either cohabiting or solo parents is due in part to long-term declines in marriage, as well as increases in births outside of marriage. But the likelihood of a child – even one born to two married parents – spending part of their childhood in an unmarried parent household is on the rise. Increases in divorce mean that more than one-in-five children born within a marriage will experience a parental breakup by age 9, as will more than half of children born within a cohabiting union. The share of children who are living with an unmarried parent varies by race and ethnicity. 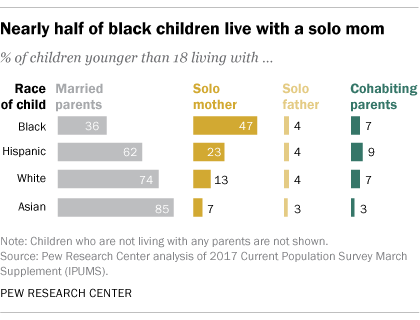 More than half (58%) of black children are living with an unmarried parent – 47% with a solo mom. At the same time, 36% of Hispanic children are living with an unmarried parent, as are 24% of white children. The share of Asian children living with unmarried parents is markedly lower (13%). The type of family arrangement a child lives in is associated with a household’s economic situation. A recent Pew Research Center analysis found that 30% of solo mothers and their families are living in poverty compared with 17% of solo father families and 16% of families headed by a cohabiting couple. In comparison, 8% of married couple families are living below the poverty line.